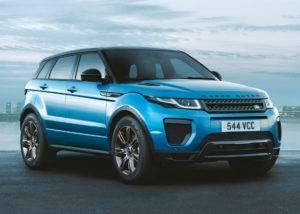 Land Rover has recently announced the new Range Rover Evoque Landmark. This beauty will be available in this vivid Moraine Blue color (pictured above) plus an option of either Yulong White or Corris Grey. Features will include 19″ Gloss Dark Grey alloy wheels; Graphite Atlas grille, bonnet, fender vent, and tailgate lettering; and panoramic roof. Land Rover Colorado Springs will keep you updated here when this Special Edition Range Rover Evoque Landmark is available here! Thanks for the comment Denise, we’ll send some more information your way! Tony- They have not been released as stock for retail to us yet. Would you like us to let you know when we have an ETA on them?